Food is the centerpiece of many Asian-American communities in the USA.There is absolutely no question about that and I can vouch for it. What are we eating today is a daily conversation in my family, and we cook everyday. And there are many memories and stories woven around food in my family. And food is the topic of conversation in thousands of Chinese, Korean, Japanese, Vietnamese and Indian communities and restaurants in the USA. But, how is their American experience changing and shaping the food in these Asian American communities? What happens when they “go off the menu”? Ever wondered about it? Well, if you did you are on the same page as filmmaker Grace Lee, who trains her lens on food in Asian-American communities in the USA in “Off The Menu.” The film is having its world premiere at this year’s CAAM Fest that starts today in San Francisco bay area. I watched the film last night and was completely hooked to it. Lee’s film hit my own food memory library big time. As Lee points out in the film, while many second and third generation Asian-Americans may not speak the language, they are fluent in the language of food. Food is their medium and bond them to their cultural roots and heritage. They have very strong food memories that reflects the inner journeys of their families and societies. Lee travels to Texas, New York, Wisconsin and Hawaii to trace the evolution and cultural bonds that people have forged in their communities. 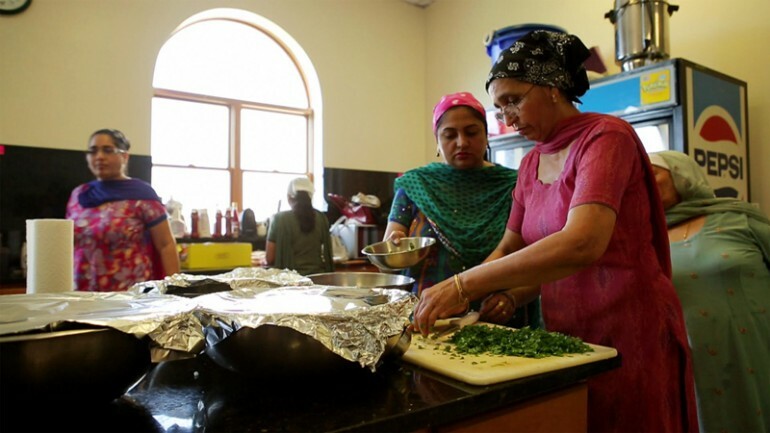 She weaves in a spiritual dimension to her culinary journey by visiting the Sikh Gurudwara in Milwaukee, Wisconsin. She discovers the importance of food and the concept of “Langar” the community kitchen, which is the hub of the Gurudwara. When she hits the road in Texas and New York she does a great job of tracking how food is evolving within these various Asian-American communities, and how they bring in local flavors into their traditional menu. Heard of Texas Sushi or Tamale Tofu? Well, those are some of the new dishes born in Japanese and Chinese restaurant kitchens in Texas, and they are in turn shaping the American palate and the Asian American community. What does it mean to be an Asian American in US today is the bigger question that Lee explores in this fascinating film. You can catch “Off The Menu” at the Castro Theatre on March 15, 2015.